Evolution has traditionally specialised in steel dry cutting technology and has pioneered advanced TCT saws which cut steel. Utilizing this know how and experience Evolution have developed this technology into a range of multipurpose saws which cut Wood and Aluminum as well as Steel. 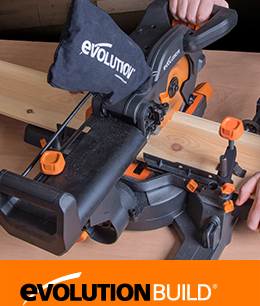 All Evolution products are manufactured to exacting standards and subjected to rigorous inspection and testing procedures ensuring a power tool which you can depend on. Based in Davenport, IA, Evolution is ideally situated to support the US and Canada. Evolution also has offices and distribution in the UK which provides sales and support for the UK and Europe. As well as our US and UK operations we also have worldwide agents in over 30 countries. 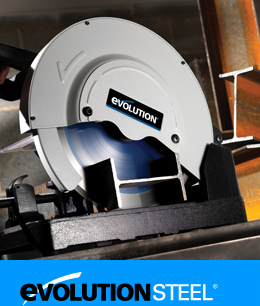 Evolution are now one of the fastest growing power tool brands in the world. Thriving on the success of their range of TCT multipurpose products, along with many other exciting innovations. Designed and specified for the steel fabrication industry for the demanding tasks of cutting and drilling steel on a daily basis. Professional standard machine. Designed for the construction industry and subsidiaries. Includes RAGE multipurpose saws which are the equivalent to top brand wood cutting saws. However, these are truly multipurpose tools; cutting Steel, Aluminum and Wood with the same blade! Multipurpose products incorporating RAGE technology but specified to appeal to the Home enthusiast rather than the professional user. 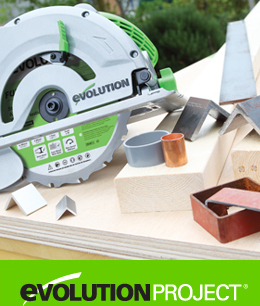 Includes the FURY multipurpose saw which cuts Steel, Aluminum & Wood, and with the same blade!